Equipmentof the Company meets modern requirements for procedures of environmentaldesigning and surveys at all stages of project implementation beginning fromdata collection up to the issue of reporting documentation. Drilling unit PBU-2-111 based on KAMAZ-43114. 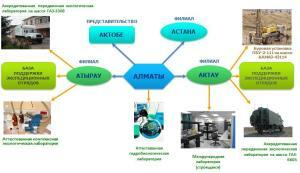 Testinglaboratory in Aktau (to be commissioned in June 2012 for further operation atinternational level). Reports, design, technical andother types of documentation are formatted and issued in KAPE specializeddepartment equipped with modern computers and printing equipment compliant withthe Company’s standards and Customer’s requirements.